As you know, the KEEP Alaska Competitive Coalition, 5,000 members strong, is a broad based group of native corporations, businesses, unions and individual Alaskans who share one common objective: We care deeply about our state and its economic future. Our mission is to promote investment in resource development and secure Alaska’s economic future by advocating for a durable, sustainable and balanced state fiscal plan that provides for stable, competitive tax policies. We recognize Alaska must address its fiscal crisis, and make meaningful progress toward fixing it, so that our oil industry, and all of our resource industries, can survive and prosper. The oil industry has paid for almost 90% of Alaska’s government. Oil has funded our schools, roads, airports and public safety. Oil strongly supports our charities and has created about 1/3 of Alaska’s jobs. Oil has funded Alaska’s $55 billion dollar permanent fund and has allowed Alaskans the luxury of not having to pay state income or sales taxes. But, times have changed. It’s been a great ride, but it’s not sustainable. 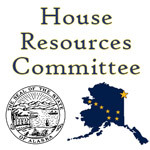 It didn’t take House Resources long to throw down the gauntlet in the form of HB 111, which raises the minimum production tax, changes the system by which the state buys credits from independent explorers and increases the interest rate on delinquent taxes. The bill was referred to the House Resources and House Finance Committees. Resources has scheduled hearings at 1 p.m. Monday and 6 p.m. Friday, Feb. 17. Testimony is by invitation only but don’t hesitate to reach out to House Resources Committee members. You can send a message clicking here. To read AOGA’s press release, click here. More oil. More investment. More revenues. The industry testified on SB 21 last week. Kara Moriarity told House Resources that SB 21 is working just as it was intended. Click here to see her presentation and here to read her press release. 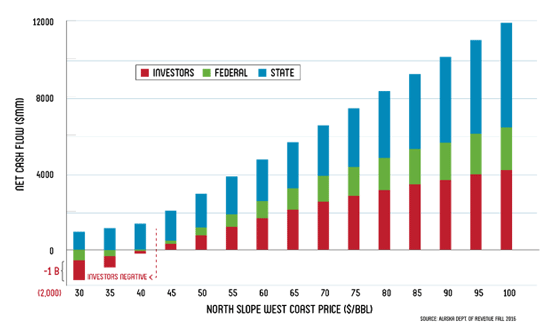 Under our current oil tax policies, Alaska’s share is higher than the producers at every price point. In fact, the state gets paid even when producers are operating at a loss because they still collect royalty, property tax and income tax. KEEP’s co-chairs penned an opinion piece in Monday’s Alaska Dispatch. In it, they point out that the solution to our fiscal crisis is not that hard. You can read it here. Robin Brena made it clear he’s not representing Alaska’s best interests when he spent two hours – and 71 slides – Friday telling the Legislature that they don’t know what they are doing.